Over on my Instagram account I've been posting Houdini books every day this month. Sadly, I still have more books to go and I've run out of days. There were a few books I couldn't locate, but I have them....somewhere. Above are all the ones I posted except for one. The last one, which will go up later today, is below. My very first book on Houdini. 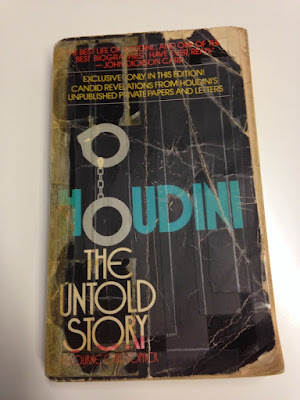 Houdini the Untold Story by Milbourne Christopher. Notice how wrecked the copy is. I actually have a pristine copy of the book as well(thank you ebay). But this one was the one I took with me everywhere as I studied all I could on Harry Houdini. Looking at the photo above however, I'm realizing there are a lot more missing than I first thought. Some are different editions of the same book. No problem, I'll find them and save them for next time. I hope you enjoyed Houdini Month. I will let you in on a secret, the plans I had for the month did not come together the way I wanted. Yes, you read that right. What I had in mind for Houdini Month was vastly different than what you saw. A couple of snags along the way, and a busy performing schedule, caused me to put those ideas on hold. I still have half a dozen articles that I've not had time to finish. 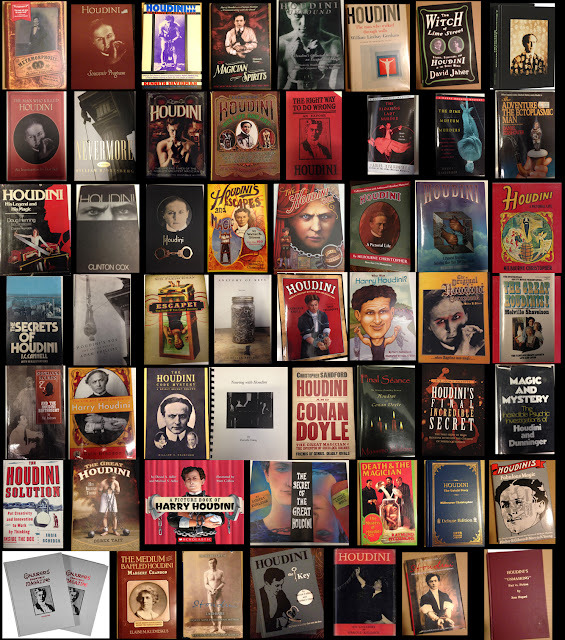 But the good news is, I'll be doing another edition of Houdini Month, down the road. Keep watching, keep reading TheMagicDetective.com. The content doesn't stop just because Houdini Month has wrapped up. There will always be more to come!!! OH WAIT. There are two more bonuses coming later today. One is a video, the other another article!